New Leak Reported At Japan's Fukushima Nuclear Plant : The Two-Way The Tokyo Electric Power Company, which owns the plant, says about 80,000 gallons of contaminated water have spewed from a metal holding tank. The leak is reportedly the largest of several at the tsunami-damaged facility. A construction worker walks beside underground water tanks at the Fukushima Daiichi nuclear plant in Japan. Operators are reporting a fresh leak of contaminated water from the grounds of the ruined Fukushima Daiichi nuclear power plant on Japan's coast. In 2011, a tsunami sparked meltdowns at the plant, and authorities have had to pump in water ever since to keep the melted nuclear fuel cool. 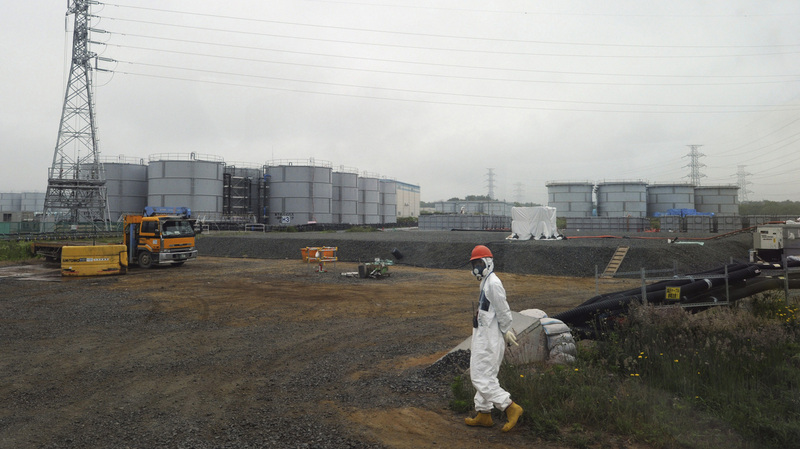 After passing through the reactors, the contaminated water is decontaminated and put into storage until it can be recirculated through the reactor cores. But it keeps leaking out. In April, it seeped from a reservoir. And a few weeks ago, the Japanese government warned that the plant itself was leaking around 80,000 gallons of contaminated ground water every day into the Pacific Ocean. This time, the Tokyo Electric Power Company says an additional 80,000 gallons of contaminated water have spewed from a metal holding tank. NHK, Japan's national broadcaster, reports says it's the largest such leak at Fukushima since 2011. It adds that "Japan's Nuclear Regulation Authority has assessed the problem as a level 1 incident, the 2nd-lowest on an 8-point international scale." The Fukushima accident as a whole has already been reported to international authorities as a level 7, or "major accident." The industry publication World Nuclear News says the leak was first spotted Monday morning local time, and that workers are removing earth around the tanks in an effort to prevent the contaminated water from pouring into the Pacific Ocean. The utility is also pumping the remaining water from the leaking tank into other tanks nearby. To try and stop the worst of the Fukushima leaks, TEPCO is looking into building an underground wall of frozen earth around the plant.